Belgium's former queen Fabiola has died aged 86, the royal palace has said. Born Fabiola de Mora y Aragon in Madrid, she was the widow of King Baudouin and reigned as queen consort from 1960 until his death in 1993. A royal statement said she died at the Stuyvenberg Castle in Brussels. The Spanish-born dowager queen was recently at the centre of a row over her annual allowance, after she was accused of avoiding a national inheritance tax. Prime Minister Charles Michel said all Belgians would remember "a great woman who will forever be part of the history of our country", while Foreign Minister Didier Reynders said the nation would now mourn her passing. "A page in our country's history has turned," Mr Reynders told Belgium's RTL television. 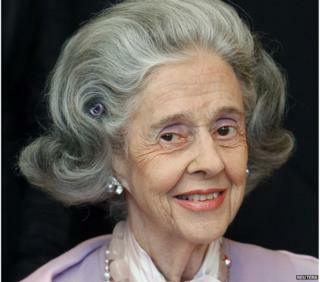 "Their majesties the king and queen and members of the royal family announce with very great sadness the death of Her Majesty Queen Fabiola this evening at Stuyvenberg Castle in Brussels," a statement from the royal palace of King Philippe said on Friday. The government is now expected to meet on Saturday to finalise state funeral arrangements. The Spanish-born royal married the popular King Baudouin in 1960 to become Belgium's fifth queen. A devout Catholic, she withdrew from the public eye after the sudden death of her husband in 1993 on holiday in Spain. The couple did not have any children, and the crown was passed to Fabiola's brother-in-law Albert, who abdicated in 2013 in favour of his son Crown Prince Philippe. In the past month, it was reported that the former queen, who used a wheelchair, had appeared increasingly frail and had limited her public appearances. In her final years, the row over her allowance caused a national outrage. A private foundation she set up in 2012 was widely seen as a way to avoid paying Belgium's 70% inheritance tax. Following the scandal the foundation was disbanded, and the dowager's annual allowance was reduced by around 1.4 million euros ($1.8m; £1.14m) to about 900,000 euros.